YES, after the shock of diagnosis there is LIFE! And it is very possible that the life you discover may be the best you have ever known. 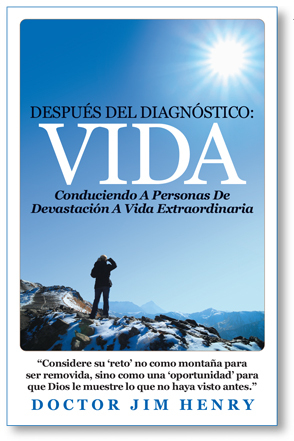 After Diagnosis: LIFE, by Jim Henry, is a book about LIFE. It’s a book about finding life, maybe the best you have ever known or lived, after the diagnosis of a life-threatening or life altering illness. It’s a practical book that offers hope, encouragement, and specific steps on how to move toward an extraordinary life no matter how severe the prognosis may be. Born out of Jim’s personal, family, and professional experiences, this book will help patients and caregivers alike to focus on things that matter most: life and people. It’s a book for anyone who desires to pursue life no matter how bad things look. When you get to the order form, after entering your name and address, you will find shipping options at the bottom of the form.